Police believe they have smashed a Romanian criminal gang smuggling children as young as five into the country to beg and steal. 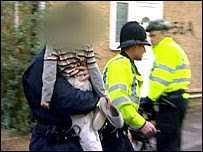 Officers from several forces, including the Metropolitan Police, raided 17 addresses across the county. At least 25 adults were held, on suspicion of immigration breaches, deception, fraud, theft and pick-pocketing. Police suspect poor families in eastern Europe may be forced into allowing gangs to take their children into the UK to carry out offences such as pick-pocketing and thefts near cash machines. They estimate that each child is worth £100,000 a year to the gangs and the Romanian authorities estimate there are up to 2,000 children who have been smuggled into Britain. The human trafficking trade now generates an estimated £5bn a year worldwide, making it the second biggest international criminal industry after the drugs trade. Karl Davis, from education and children services, told BBC News: "We carried out individual assessments on all these children and five children remain in our care." "Five families have come forward and we are satisfied that the arguments made were sufficient and we were happy for them to return to their families. We assessed them fully in terms of what the children and families told us. Some of the families were in the homes that were raided but some traveled from outside of Slough." "Some of the children were too young to tell us much. The youngest is two years old and there are two 14-year-olds. The two-year-old is still in our care." The same article has an interview with Christine Beddoe of ECPAT, a global network of organizations working on eliminating child exploitation. She speaks a bit more to the areas the UK will need to improve on in order to help children suffering from exploitation. According to Reuters, the operation was codenamed "Caddy" and Commander Steve Allen stated that more arrests are expected. Other articles seem to confuse trafficking with smuggling, and others yet call into question whether the children were actually unaware of what was happening. I'm sure the two-year-old gave consent for the family to sell him/her and then viciously hit the streets to steal. I apologize for the sarcasm, but child trafficking targets the most vulnerable group in society and even if or when the children are saved, they are faced with the lifelong burden of their experience. According to a 2005 article on Turkey's efforts to combat human trafficking, only 30 percent of victims of human trafficking recover to the point of leading a normal life. This is of course, the identified victims that organizations and governments are able to document. I can only hope the children who were returned to their families in Romania will not be sold again. This article also details another cost of human trafficking that I think is striking as I tried to find other articles on the case and found many had some sort of condescending or doubtful tone to it. "Another human cost of migrant smuggling is the damage that is done to the image of migrants, and an increase in xenophobia. Up until now, unmanaged migration flows in destination countries have resulted in a perception by the general public that migrants are to blame for the growth in organized crime. But migration is an issue that affects us all; it is and always has been a natural human phenomenon. That is why it cannot be left to criminals to manage migration for us." Even the BBC was ready to point out how crimes by people of Romanian origin was quick to increase in the UK after Romania's accession to the EU so the article makes an important statement. Human trafficking is still not a phenomenon we completely understand and until we realize the extent of the damage it is doing, a complete solution will not be reached.